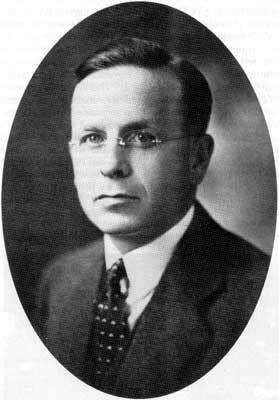 When Premier John Bracken decided to accept the leadership of the federal Conservative Party in December 1942, the Manitoba Progressive Coalition selected the Provincial Treasurer, Stuart Garson, as his successor. Premier of Manitoba from January 1943 to November 1948, Stuart Garson would preside over the extension of the coalition arrangement into the post-war era. Premier Bracken and the old United Farmers of Manitoba (U.F.M.) had committed the province to an experiment in group government with the intention of breaking the hold of the traditional parties over the provincial administration. Under Stuart Garson this coalition was, to a great extent, transformed into a tactical device designed to perpetuate the rule of the Liberal-Progressive Party. 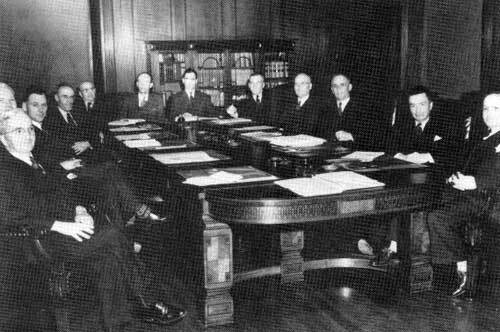 Manitoba provincial cabinet, 1942. Stuart Garson is at the extreme right. The Great Depression reinforced the government’s determination to reduce public expenditure. The depression was made worse on the prairies by one of the most prolonged dry spells in Canada’s history. Neither the province nor the municipalities had enough surplus revenue to meet the sharply rising cost of relief. Thus between 1931 and 1933 the province imposed increases in taxation which raised Manitoba’s tax rates to the highest of any province in Canada. Nevertheless this achieved nothing more than to make up for previous declines in revenue and the vast portion of relief had to be paid for by increased borrowing. By 1932 the credit of the province and its municipalities was exhausted and thereafter the federal government had to guarantee loans made to either the municipalities or the provinces. As Provincial Treasurer Garson represented Manitoba on the various committees that met to discuss the financial crisis facing the provinces. Garson quickly became an expert on federal-provincial relations and emerged as one of the most powerful ministers in cabinet. His crowning achievement as Treasurer was the role that he played in the preparation of Manitoba’s brief to the Royal Commission on Dominion-Provincial Relations in 1937 and 1938. This brief was hailed as a masterly treatment of Manitoba problems and was regarded as the best provincial brief presented to the commission. The Tuesday morning meeting with Bracken lasted less than an hour. This was followed later in the afternoon by a joint meeting of the combined Liberal-Progressive, Conservative and Social Credit parties. Forty-one of the fifty-five members of the legislature were present  and gave unanimous approval to the continuation of the coalition government and to the leadership of Stuart Garson. Bracken formally resigned as Premier in early January 1943. Stuart Sinclair Garson, inheriting a rural-based and rural-orientated government, was sworn in as the thirteenth Premier of Manitoba on 14 January 1943. While the U.F.M. and Premier John Bracken had a philosophical belief in non-partisan government, to Stuart Garson the central utility of the all-party coalition appears to have been as a tactical device to maintain the dominance of the Liberal-Progressive party in the Legislature. An example of this utilitarian belief in non-partisanship is the position taken by Garson during the 1943 by-elections. By the middle of 1943 the electoral district of Killarney had been without a member in the legislature for almost two years and three more electoral districts, including John Bracken’s former seat of The Pas, were also vacant. The central question within the Liberal-Progressive party was whether or not the coalition arrangement would be maintained. Many of the same arguments that had been advanced in December 1942 were again being cited. As the arrangement stood, if a seat represented by a Conservative member (as Killarney had been) became vacant, the Liberal-Progressives and Social Crediters were committed to stand aside. The same was true in a Liberal-Progressive or Social Credit seat; the party which held the constituency had the sole right among the parties of the coalition to contest it. This resulted in a unusually high number of members being elected by acclamation as the smaller parties did not have the funds to field a full slate of candidates. Several members of the Liberal-Progressive party, however, were urging Garson to abandon the arrangement, and the coalition with it, by supporting the nomination of a Liberal-Progressive candidate in Killarney even if the Conservative candidate declared his support for the government. Stuart Garson dismissed these overtures after a very pragmatic analysis of the utility of the coalition arrangement. In other words the continuation of the coalition was the best method of preserving a Liberal-Progressive majority in the legislature because the only opposition would come from the C.C.F. and thus the existing distribution of seats would most likely continue. Thus the Liberal-Progressive, Conservative, and Social Credit party associations in Killarney nominated and supported a single candidate, A.W. Harrison, who easily defeated his C.C.F. opponent by a vote of 1,377 to 988. As a result of the election in the northern constituency of The Pas, which had been represented by the former Premier John Bracken for twenty years, the C.C.F. increased its membership in the legislature to four. This was partly due to the fact that the “old-line” parties were unable to nominate a common candidate and thus split their vote. These two results showed the value of the coalition as an electoral tool and guaranteed the continued existence of the arrangement at least until after the next provincial election. By-elections are quite commonly regarded as barometers for measuring the mood of the electorate prior to a general election. Therefore, both the government and the C.C.F. tested what would become their provincial election platforms during the 1943 by-elections. The C.C.F. attacked the coalition government on its record of social services and social spending. It urged the government to adopt a social service system based on the one that existed in New Zealand. The Labour party government of New Zealand had, in 1938, introduced a comprehensive social security act which increased the rates of the country’s various pensions and placed them on a universal basis irrespective of income received or property owned. At the same time the act initiated an extensive system of health and medical benefits. The coalition government and Premier Garson attacked this C.C.F. position with a vengeance. The New Zealand social security system had resulted in substantial tax increases in that country. If a single Canadian province attempted to establish such a system and the corresponding taxation it would be at the risk of “driving business to more favourably situated provinces, in which the rates of taxation were lower.”  While New Zealand was a unitary state, Manitoba as a province in a federal state had neither the financial base nor the constitutional power to introduce such an extensive social security system. It may be argued that the policies developed during the by-election campaigns by the government and the C.C.F. opposition differed greatly in method but little in goals. Both sides were in agreement on the issues of post-war employment and the need for some sort of social welfare system, and the difference was one of degree and method. While the C.C.F developed a proposal that called for the nationalization of the banking industry to finance social spending,  the government coalition insisted that a comprehensive social security programme could only be developed by the federal government. It asked the voters to “appraise the issues on a basis of logic and intelligence”  and the reality of the situation was that the types of policies and programmes which were being proposed were outside of the constitutional or financial jurisdiction of the province. By stating that the role of the province was not in initiating the programs but in applying pressure on the federal government to establish them, the government appeared to be side stepping the issue. This was in marked contrast to the bold proposals of the C.C.F. Even if these proposals were impossible to implement they were attractive to voters who feared the return of depression conditions after the end of the war. Thus in Brandon, the constituency where the argument over social policy was most intense, the coalition candidate went down to defeat despite the deluge of facts and figures repudiating C.C.F. claims. Since the 1920s Winnipeg had been organized as a single ten-member seat. Instead of marking their ballots with a simple “X” Winnipeg voters were asked to number their choices in order of preference on the ballot. In 1945 there were twenty-two candidates. This system created confusion among voters which often worked to the advantage of the coalition. Furthermore, with only ten seats, Winnipeg was grossly under-represented in the legislature. While roughly one half of the population of Manitoba was concentrated within the greater Winnipeg area, it elected less than one quarter of the members of the legislature. The last redistribution in 1920 had established a ratio which made each rural voter the equivalent of two urban voters. This system assured the over-representation of precisely that segment of voters on which the coalition depended. Once the Manitoba coalition had survived the transition of government from Bracken to Garson, the 1943 by-elections, and the 1945 provincial election, it had to face its most serious test. In June 1946 the Manitoba Progressive Conservative party held its first convention in almost eight years. This convention was held in the majestic surroundings of the Royal Alexandra Hotel. The delegates at the opening session of the two day convention heard Errick Willis, the provincial party leader, ask for continued support for the coalition. He argued that it was important to keep a united front until after the storms of the federal-provincial conferences had been weathered and a satisfactory new constitutional agreement made. “If we should withdraw from the coalition and the conference should fail,” Willis warned the delegates, “certainly we should have to bear criticism for withdrawal at such a critical period.”  As evidence of the coalition’s popularity Willis cited the election results of 1945. Not one Liberal-Progressive or Conservative who had opposed the coalition was elected. Willis saw this as an indication of confidence in the coalition form of government. However rumours had been circulating for several weeks that the drive to withdraw the Conservative party from the coalition was gaining momentum. The convention was seen as the climax to this drive. Premier Garson himself believed that an attempt would be made to withdraw. In a letter to Ralph Maybank, a Manitoba Liberal Member of Parliament, the Premier wrote that he felt “that some attempt will be made to have the Conservatives withdraw from the Coalition, but I would doubt that it will get very far.”  This doubt was based on the fact that there was impressive support within Conservative party circles for the continuation of the coalition. Heading this “sectionalism” were the Premiers of Ontario and Quebec. It was Garson’s open criticism of Ontario Premier George Drew, a Progressive Conservative, that formed the second grievance of the young Conservatives. Premier Garson had declared Drew to be the person most responsible for the breakdown of the last Dominion-Provincial conference. This did not sit well with the malcontents. Finally there was a dissatisfaction with the leadership of Errick Willis. This arose out of the belief that Progressive Conservative party was increasingly sacrificing its identity by remaining in the coalition. All of these considerations combined to form a fairly substantial anti-coalition movement. The question was whether or not this movement was strong enough to control the convention and thus smash the coalition government of Premier Stuart Garson. On the morning of Thursday, 13 June, 1946 the malcontents attempted their coup. A resolution to conduct a leadership vote was presented to the convention. The motion, moved by an urban candidate from Winnipeg, was immediately declared out of order. The executive had no intention of holding a leadership votes; this was after all a policy and not a leadership convention. After much wrangling on points of order and proper procedure it was agreed to hold a vote of confidence in the leadership of Errick Willis. The vote was set for late in the afternoon. This essentially ended the coup. The malcontents had intended to topple Willis and install a new leader in one swift move. By setting the vote of confidence for late on the final day of the convention the party executive ensured that, even if Willis lost, any new leader would be chosen at a later date. This would give the coalitionists time to organize and thus greatly reduce the chances of the anti-coalition movement in electing a sympathetic leader. This bit of extra insurance was not needed however, because Willis was sustained by a 2 to 1 margin. The dissolution of the coalition had been averted, and the coalition was not to be seriously challenged again during the remainder of Stuart Garson’s premiership. 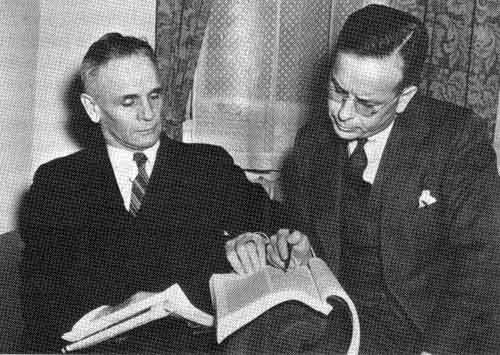 Stuart Garson with Premier John Bracken, 1942. Whatever Garson’s true reasons for delaying his entry into cabinet may have been, when he resigned as Premier on 13 November 1948 the continuation of the coalition was not in serious doubt. When the coalition was established in 1940 its purpose was to maintain a stable government for the duration of the war. Stuart Garson presided over the extension of this arrangement into the post-war era. This was not the result of a philosophical belief in non-partisan government, as had been the case with John Bracken, but was chiefly a tactical move to maintain the dominance of the Liberal-Progressive party. Although Bracken seemed to have established non-partisan government in 1940 the treatment and subsequent withdrawal of the C.C.F. ended this experiment even before Garson became Premier. After that there was both a “government” and an “opposition” and partisan politics resumed as before. Garson never lamented this state of affairs and while in public he maintained the facade of non-partisanship, in private he saw the coalition as a matter of tactics and strategy. “I don’t know for the life of me how the coalition ever came to be formed,” Garson once told Prime Minister Mackenzie King, “we had a majority. We were getting along. Then suddenly it occurred!”  But once it did occur, Garson saw its value. In his correspondence with Thomas Crerar, Garson clearly realized this case. Later when members of his own party indicated a desire to abandon the arrangement he calmly pointed out that the system favoured incumbents. The Liberal-Progressives, with the largest number of members in the legislature, thus had the most to gain by the continuation of the agreement. Liberal moderation in contrast to “the doctrinaire views of conservatives and socialists” was essential if Canada was to successfully overcome the sweeping social changes that had accompanied the shift from agrarian to industrial society. This same moderation was also vital in provincial affairs if major programmes and policies such as rural electrification were to be successful. All this provided formidable reasons for the Conservatives to withdraw from the arrangement and yet they did not. In election after election the party was slowly losing strength and yet the party executive continually endorsed the coalition agreement. Thus when Garson left for Ottawa in 1948 all seemed well with the Manitoba government, but the coalition system established by Bracken and maintained by Garson would not long outlast the departure of its pragmatic steward. 1. Frank H. Schofield, The Story of Manitoba, Vol. 2 (Winnipeg: S. J. Clarke Publishing Co., 1913), p. 33. 2. Winnipeg Free Press (hereafter FP), 23 Dec., 1942. 4. Legislative Library of Manitoba, Reading Room, Biography Collection: Stuart S. Garson, Snyder to Meighen, 9 Feb., 1915. 6. John Kendle, John Bracken: A Political Biography (Toronto: University of Toronto Press, 1979), p. 156. 7. FP, 22 Sept., 1936. 9. Thomas Peterson, “Ethnic and Class Politics in Manitoba,” in Canadian Provincial Politics, ed. Martin Robin (Scarborough: Prentice-Hall, 1972), p. 88. 10. Royal Commission on Dominion-Provincial Relations: Report Book I (Ottawa: Dominion of Canada, 1940), p. 168. 11. See W. L. Morton, “The Bias of Prairie Politics,” in Contexts of Canada’s Past, ed. A.B. McKillop (Toronto: Macmillan Co., 1980), pp. 149-60. 12. FP, 4 Nov., 1940. 13. Nelson Wiseman, Social Democracy in Manitoba: A History of the CCFNDP (Winnipeg: University of Manitoba Press, 1983), p. 32. 15. Provincial Archives of Manitoba (hereafter PAM), Stuart S. Garson Papers, p. 2358, Crerar to Garson, 12 Dec., 1942. 16. Farmer to Bracken, 9 Dec., 1942. The text of this letter appears in FP, 10 Dec., 1942. 17. PAM, Garson Papers, p. 2358, Crerar to Garson, 12 Dec., 1942. 21. Ibid., Garson to Crerar, 21 Dec., 1942. This letter, dictated only one day before the meeting of the Liberal-Progressive caucus, was never sent. 22. Ibid., Crerar to Garson, 31 Dec., 1942. 24. FP, 22 Dec., 1942. 26. The legislature had 57 seats but two vacancies, caused by death, had not yet been filled. 27. FP, 23 Dec., 1942. 28. PAM, Garson Papers, p. 2357, Garson to A. E. Foster, 30 April, 1943. 30. FP, 23 June, 1943. 31. This analysis of the results in The Pas was that of Stanley Knowles, then M.P. for Winnipeg North Centre, as quoted in FP, 18 Aug., 1943. 32. PAM, Garson Papers, p.2357,Notes Regarding a Speech by Dr. Dwight L. Johnson CCF Candidate in the Brandon By-Election, Nov., 1943. 33. Ibid., Speech Materials Used by Premier Garson in the Brandon By-Election, Nov., 1943. 34. Stuart Garson, Submission to the Special Committee on Reconstruction and Re-establishment, 2 June 1943. 35. PAM, Garson Papers, p. 2357, Speech Materials Used by Premier Garson in the Brandon By-Election, Nov., 1943. 36. Portage la Prairie Daily Graphic, 19 Oct., 1943. 37. A Socialist and a Communist were the two independents who were elected. 38. FP, 16 Oct., 1945. 39. PAM, Provincial Elections: 1870-1949, MG 14F, Summary of the 1945 Election Results. 40. FP, 16 Oct., 1945. 41. Peterson, p. 84, and Lloyd Stinson, Political Warriors: Recollections of a Social Democrat (Winnipeg: Queenston House Inc., 1975), p. 107. 42. James A. Jackson, The Centennial History of Manitoba (Toronto: McClelland and Stewart Ltd., 1970), pp. 244-45. 43. Premier Stuart Garson as quoted by FP, 16 Oct., 1945. 44. FP, 17 Oct., 1945. 46. Ibid., 12 June, 1946. 48. PAM, Garson Papers, p. 2358, Garson to Ralph Maybank,12 June,1946. 50. PAM, Garson Papers, p. 2358, Garson to John S. Sinnott, 2 July, 1946. 51. Ottawa Evening Journal, 8 June, 1946. 52. FP, 14 June, 1946. 54. Transcripts of the Mackenzie King Diaries (Microfilm) (Toronto: University of Toronto Press, 1980), 6 May, 1946. 56. Ibid., 5 Nov., 1948. 57. Mackenzie King Diaries, 15 Nov., 1948. 58. PAM, Ralph Maybank Papers, MG 14 B35, Diary, 27 Jan., 1948. 59. Queen’s University Archives, Thomas A. Crerar Papers, Box 168, Series V, Remarks of Stuart Garson at the Annual Meeting of the Saskatchewan Liberal Council, 10 Feb., 1954.